Energy efficiency is no joke. According to the Australian Greenhouse Office, Australians are one of the world’s highest greenhouse gas polluters per-capita, with around a fifth of Australia’s total emissions coming from homes. It is estimated that each home is responsible for approximately 15 tonnes worth of greenhouse gases per annum. This figure includes transport as well as various household wastes, all of which ultimately ends up in landfill. There are several ways that Australian households and businesses alike can reduce their electricity related greenhouse gas emissions. While installing solar panels on your roof might seem like the obvious (or only) solution, if you can’t quite afford the upfront cost, there are several other solutions available. To begin with, you can invest in energy efficient appliances and implement strategies to ensure that you are using your existing appliances in the most energy efficient manner possible. There are a number of benefits to choosing energy efficient practices in your home. Not only is it a great way to lower your environmental impact, but it will help keep your power bills to a minimum. In Australia, all electrical appliances (including dryers, dish washers, washing machines and fridges) must be manufactured and sold with an energy rating. You are probably familiar with this energy rating system: it is in the form of ‘stars’. The more ‘stars’ an appliance has, the more energy efficient it is. If you’ve narrowed down your appliance search to two models, why not make your final decision based on the its energy ‘star’ rating. After all, the more ‘stars’ an appliance has, the more power (and therefore money spent on electricity bills) you’ll save. Use the Australian Government’s Energy Rating Website to shop around and compare the energy efficiency of different models and types of different appliances. Purchase the right size appliance for your needs. If you purchase a product without conducting research, you may end up paying for unnecessary electricity. For example, if you opt for a fridge that is far too large for your needs, you’ll still be using (and paying for) the power needed to cool every single shelf. Similarly, if you opt for a fridge that is too small, you’ll pack everything in so tightly that it has to operate at a higher, harder level, once again using more power than necessary. Compare the water efficiency of products when you are purchasing a product that requires ample amounts of water. Look for a model with economy cycles. Choose appliances that offer a range of different settings, particularly economy settings. This way, you can align your requirements with the appliance’s performance, and use less power in the process. Consider gas-fired or heat-pumping appliances as an alternative to electric. While varying in geography and circumstances, there are often rebate options available to help you invest in more energy-efficient appliances. One of the biggest misconceptions about appliances is that they are all created equal. Each product you buy is individual and needs to be fitted into your unique space. You can save money, energy and stress by purchasing the right appliance for your needs, and ensuring you use it efficiently. 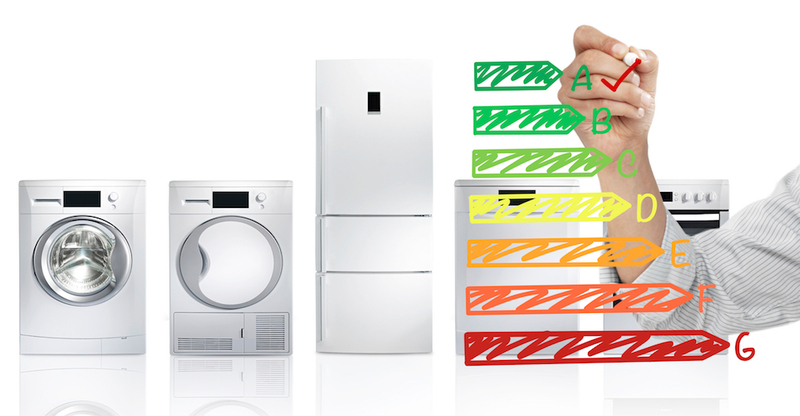 The specifications, position and operations of an appliance all affect the output of energy. For instance, if your fridge is next to your oven, it will have to work harder to keep your food cold. To combat this, regularly check the manufacturers care instructions for your appliance, as keeping it in good working order will ensure it works better and longer. Switch your appliances off at the wall when they aren’t in use. There are many appliances that can be switched off completely, including phone chargers and unused audio visual equipment. One of the biggest users of ‘standby mode’ is microwaves. Generally speaking, microwaves use more power in standby than they do actually cooking food. Use energy-saving power boards. Plug secondary electrical equipment (such as printers and monitors) into these so that when the primary electrical equipment (such as the computer) is switched off, the secondary equipment is automatically switched off as well (instead of being left in standby mode). If you go away on holidays, always remember to turn off electrical equipment at the wall. There are some exceptions to this rule of course: don’t unplug your fridge and freezer and return home to piles of spoilt food. Another way we contribute to emissions is the way we dispose of our used appliances. Whether energy efficient or not, it’s important to think about your wastage when it comes time to update. Electrical appliances that are still in good, working order can be re-used or re-purposed. Your best bet is usually to contact a local charity or op-shop. Whether you’re a business, an individual, or a family, being conscious about your energy emissions is important. Acting is even more important. If you’re interested in maximising energy efficiency in your environment, or just keen to make a few changes, large or small, any contribution counts.